Home » Trending Now » Why is Warner Bros trending? Why is Warner Bros trending? It’s not a bird and it’s not a plane. 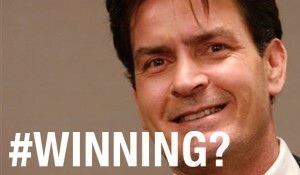 It’s just Charlie Sheen. Warner Bros fired Charlie Sheen because in case you’ve been missing the saga, Charlie Sheen is burning all his bridges and pointing fingers in places he probably shouldn’t be pointing his finger. So…now Charlie really is an unemployed winner.